Dr Yifeng Fu holds a PHD degree from Chalmers University of Technology in microelectronics. Before joining Chalmers, he has worked in SHT Smart High Tech AB as project manager and research manager, where he was in charge of the overall research and development of materials and technologies. 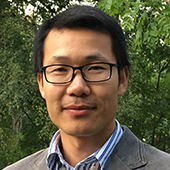 His research interest covers carbon nano- and 2D materials for 3D electronics packaging. This includes the synthesis and processing of CNTs, graphene and related 2D materials for thermal management and interconnect applications. He has published more than 50 papers in journals and proceedings. There might be more projects where Yifeng Fu participates, but you have to be logged in as a Chalmers employee to see them.